Love it or hate it, work is an important part of our lives. Heading into the office may be a stressful time of the day if you’re forced to deal with traffic, big projects, or boring tasks. One thing that doesn’t have to bring you grief when it comes to doing your job is your outfit. Looking your best at work can help you feel good about the job you are doing, meaning you can focus on the tasks at hand. You may not get a promotion for looking good, but it sure doesn’t hurt to dress professionally, and stylish. Putting together just the right professional look should be enjoyable. For trendy women, putting the flare into office attire might be the easiest part of the day. With a little inspiration, your professional goals can (and should) include looking your best for work. Whether you are preparing for a big interview or just looking to amp up your work wardrobe, these outfit combinations will leave you feeling great. You will be able to feel bright until five o’clock hits with one of these perfect office looks. Throw on that pencil skirt and grab your blazers. Some office styles include plain patterns in neutral colors. While these can be great and stylish, brightening things up is a nice change. Pair a patterned pencil skirt with a matching blouse in a bright color to your heels. 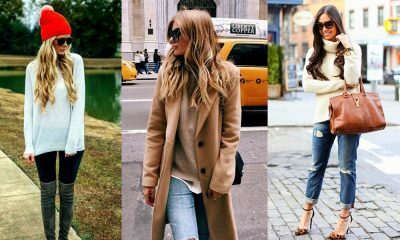 Add in some neutral colors with a sweater and handbag to keep things light and professional while still exploring your favorite color trends. Even a small amount of color can have a big impact on the working girl’s wardrobe. A blouse in your favorite color pairs with neutrals to give just enough burst of color without going overboard. Wear a neutral blazer to match your skirt and a darker handbag that matches the shoes to recreate this look in your own way. You can easily reverse the color scheme by using bright colors to accessorize. Keep a neutral look when picking your office basics. Next, Choose the color you want and keep your accessories in similar shades. This will give you the effect of looking professional without looking like you tried too hard at all. The basics of office wear are fairly simple. With a goal to look professional, you just have to go from there. Pearls and pumps are long time classics for work. The neutral colors keep the whole look completely professional and are a great outfit for days when you just don’t know what to wear to work. Dresses can be a lot easier to piece together than skirt outfits. Keeping things neutral, this professional look is simple and elegant. Choose a dress that fits you well and doesn’t contain bold patterns and prints that might be more distracting than professional. Jewelry should be simple and charming to match your attire. When adding color to a dress style, it is important not to overdo it. Adding too much can really hurt the office look. Use simple patterns instead. 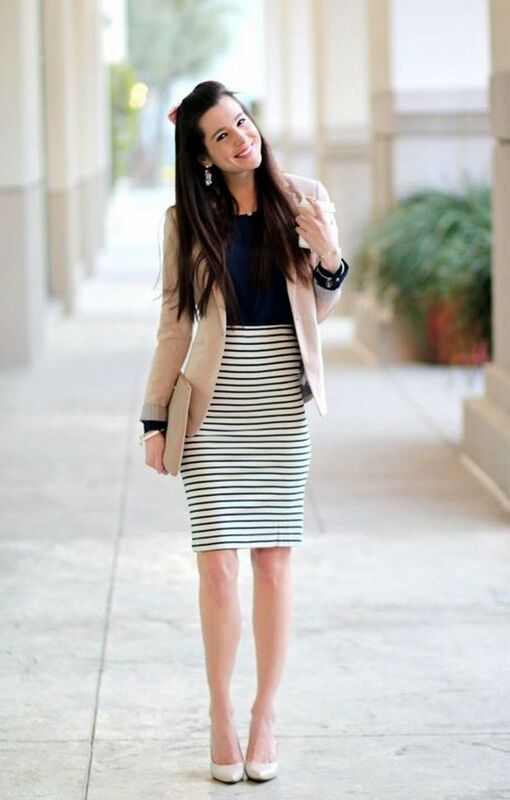 Stripes are classy and can utilize a pretty color. This pastel yellow is accessorized with a matching handbag. The remaining accessories are simple and neutral for a perfect office style. Pantsuits are not the only way to wear pants to work. Pants paired with a neutral blouse and a nice sweater make a classy look that works in and out of the office. You can even throw in some colors to give the style even more flare. Aqua is trendy and looks perfectly fashionable on the working woman. Dark colors are perfect for the fall and winter. Navy blue is a great option to wear to the office when the weather gets cold. 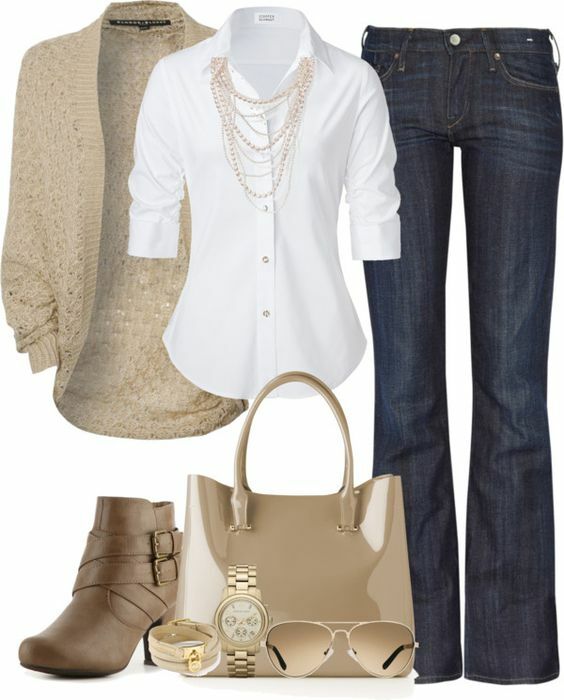 Pair your blouse with your shoes and handbag and keep your jewelry simple in gold or silver color schemes. Make sure your pants are in a neutral color when using a lot of one color elsewhere. If wearing a bright pair of pants to work, you’ll want to keep the rest of your outfit fairly simple. Choose simple but complimentary pairings for your top, and keep jewelry and shoes basic. 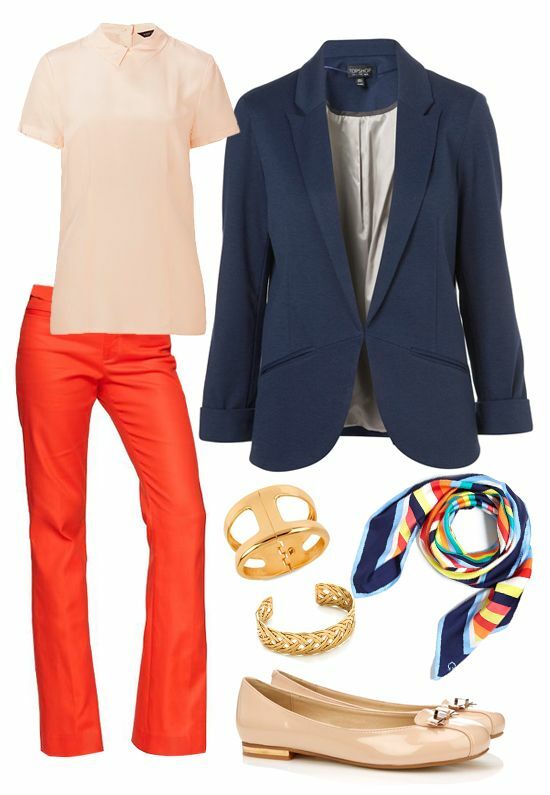 A scarf that uses the same color as the bright pants will help pull the whole look together perfectly. Some office jobs will allow you to wear jeans, or at least on casual Friday. In this case, casual doesn’t mean wearing pajamas to work. Choose a clean print jean rather than one you might wear on the weekend with paint splatters and ripped jeans are best left for after work.